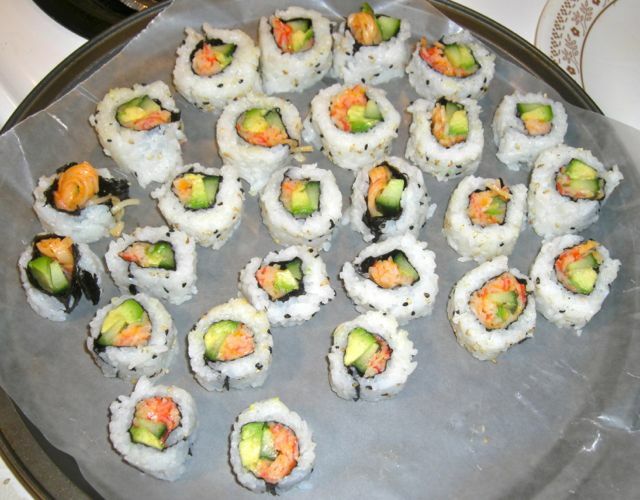 In my sushi making experience, I've made and consumed many California rolls (and posted about them here). 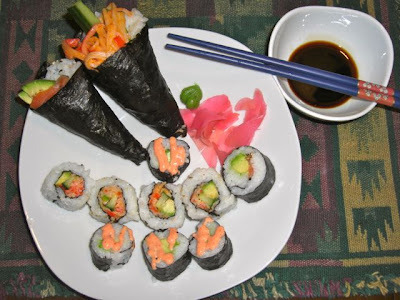 I recently became obsessed with spicy sauce and all the joyous possibilities associated with making spicy sushi maki at home. 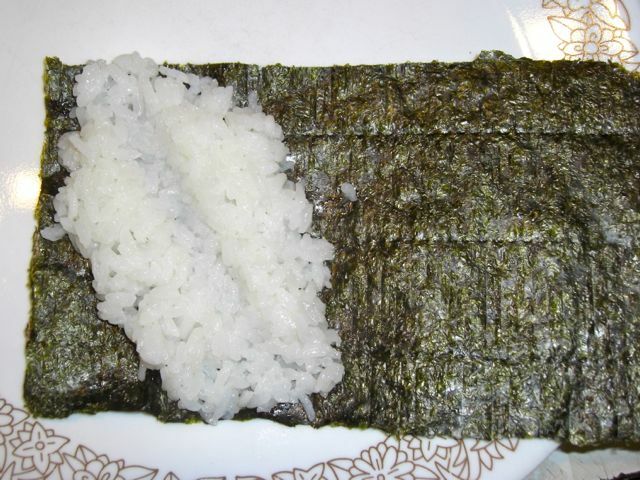 I have been collecting ingredients over the past few weeks and yesterday it was finally Sushi Fun Day for me. My morning started with how to videos on YouTube, as I was experimenting with hand rolls and trying to properly prepare the sushi rice (I picked up Rice Vinegar to add to it!). 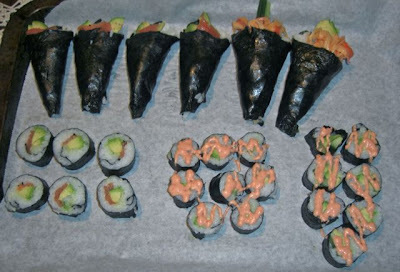 My morning instructional videos got me pretty excited about the idea of eating a whole lotta yummy sushi! 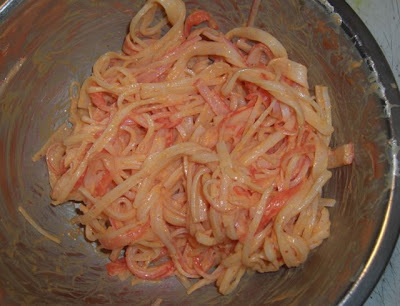 I shredded some imitation crab legs and tossed them with spicy mayo (mixture of Hellman's and Sriracha Sauce). 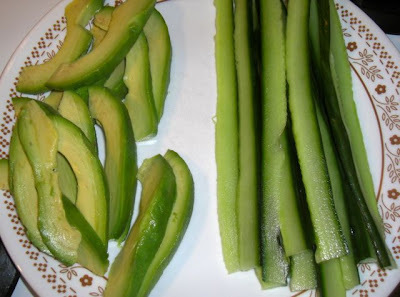 So easy to make and super yummy to eat. Also important were the avocados and cucumber! 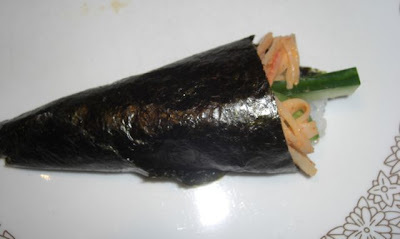 Then I rolled it up! 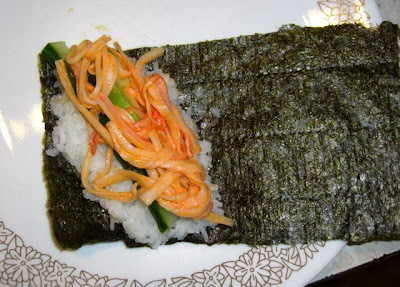 Another adventure in sushi for me yesterday was maki with the rice on the outside of the roll. I wrapped my bamboo mat in plastic wrap and went for it! 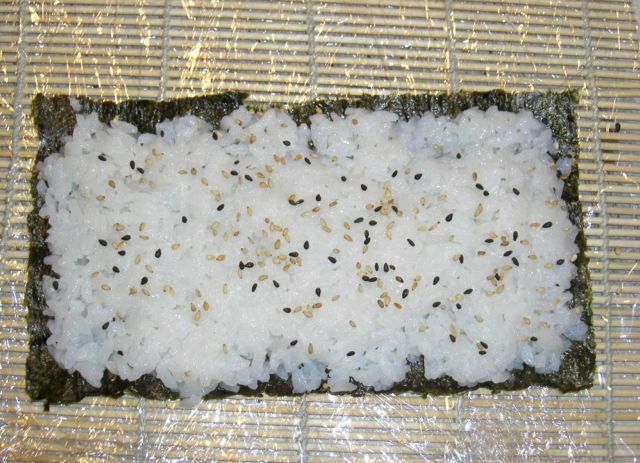 I added rice to the Nori sheet and sprinkled it with toasted sesame seeds. 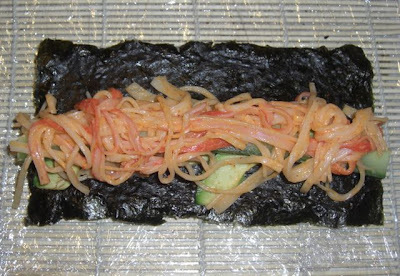 And then rolled it up! I also made some smoked salmon and avocado hand and maki rolls, avocado maki, and avocado and cucumber maki. I put some spicy sauce on some of the maki to make it look and taste amazing. Not pictured are the four hand rolls John and I ate while I was preparing everything and the countless pieces of maki that accidentally got eaten. I can't wait to make it again!! And we are eating leftovers for dinner tonight. Yay! !